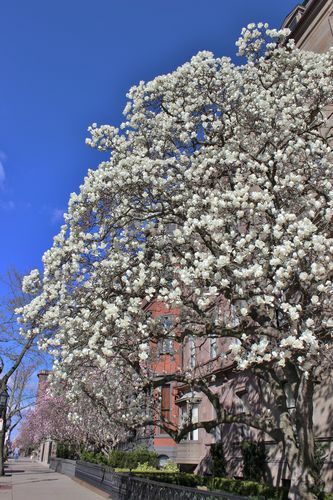 Magnolia trees are ancient beings, dating in fossil remains to 95 million years ago. They evolved before the presence of bees and although the trees produce pollen they do not produce nectar so beetles are the pollinators of the species. The seeds of the magnolia are encased in brightly colored fatty material called aril that attracts and feeds migrating birds. There are approximately 210 species of Magnolias and because of their ancient history before the drift of continents , ice ages, and other catastrophic events, the various species enjoy wide distribution around the globe and are native to; North, Central and South America as well as the West Indies and most of far eastern Asia where the more cultivated and attractive species originate. In 1820 a retired Napoleonic Cavalry Officer, Etienne Soulange-Bodin cross breed two Chinese specimens, Magnolia Denudata and Magolia Lliifloria to create the early blooming, large petaled Magnolia Xsulangiana. 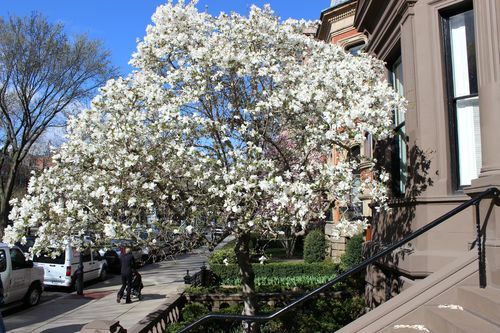 It is this beautiful magnolia that was planted with such success in the small formal gardens in front of the handsome townhouses of Back Bay. 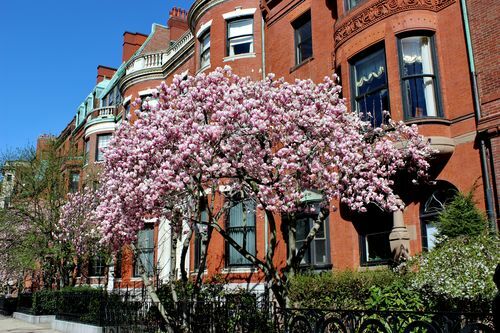 The Magnolia’s of Commonwealth Avenue, Back Bay Boston have a long and venerable history one of the seminal specimens being the Magnolia Denudata at 6 Commonwealth Ave, already reaching second floor height in 1933. 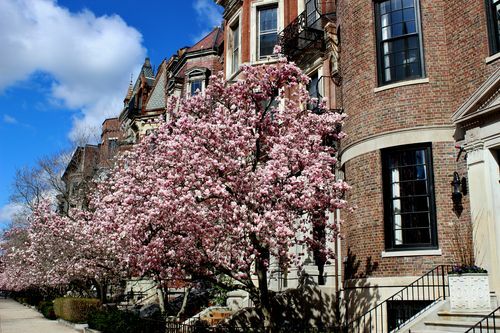 The proliferation of the majority of these beautiful trees was a result of the concerted efforts of the formidable neighborhood activist and early ecologist, Laura Dwight. Miss Dwight conceived a plan to regenerate and beautify her neighborhood by planting magnolia trees especially along Commonwealth Ave. Her extraordinary efforts over a number of years involved; land owners, tenants, collages, clubs and local Fraternity Brothers – for the mussel needed to do the planting – as well as a host of Back Bay neighbors. The most productive years of planting took place from 1963 to 1965. 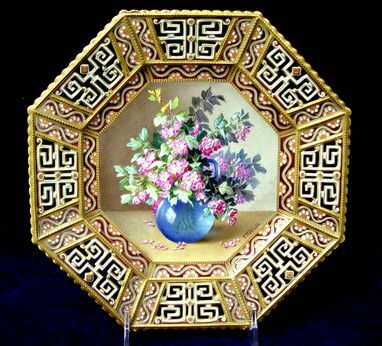 The idea was to create a harmonious parade of spring blossoms especially along the sunny side of the central avenue partially inspired by the famous plantings in Washington D C and Richmond Virginia. 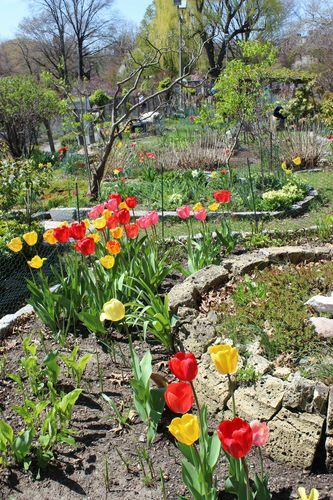 As we leave Back Bay and continue on to the Fenway Victory Gardens we stop for a brief visit at “the Garden of the Two Happy Husbands” Leo and Iory’s garden where the bright colored Spring blossoms are trembling in the brisk morning sunshine. This entry was posted in Commonwealth Avenue, Visiting Beautiful Gardens on May 23, 2015 by ioryallison3.